Is relief available for this embedded ball? See last paragraph of blog for answer. It is surprising how many times I hear of golfers in a stroke play competition that have a doubt as to how they should continue play of a hole, because they are uncertain of, or cannot agree on a ruling. Usually, they gamble on taking one of the options and hope for the best. For example: Is the permitted drop within one club-length of two? Must the ball be dropped, replaced or played from where it came to rest? May a ball be played out of GUR? Is there relief from an area close to a putting green that has obviously been damaged by a course maintenance vehicle? 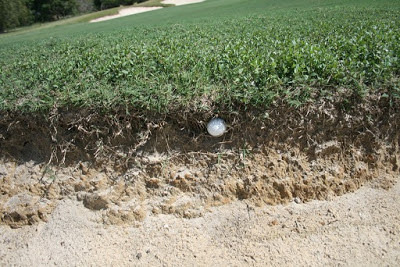 Is there relief for a ball that is embedded in the side of a bunker, as in the photo above? It is not surprising that these uncertainties occur during a round of golf. The Rules have evolved over the long history of the game to provide definitive solutions for the myriad of circumstances that can possibly happen on the course and players cannot be expected to know them all. Those who advocate that they should be simplified by drawing a red line over a majority of the clauses making up the existing 34 Rules, plus over twelve hundred Decisions on the Rules, do not satisfactorily explain how the inevitable disputes that would result from such a course of action should be settled, both on and off the course. Whilst Rule 6-1 places a responsibility on every golfer to know the Rules, there is also a Rule that provides players with a way of proceeding when they don't. The player may play out the hole with two balls, choosing which one they want to count if it has been played within the Rules. To take advantage of this Rule the player must follow the procedure that is set-out in Rule 3-3a, arguably the most underused Rule in the book. Note that if a second ball is played that fact must be reported to the Committee before returning the score card. This is true even if the player had the same score with both balls. Rule 3-3 only applies in stroke play; players are not permitted to play a second ball in match play. See this previous blog of mine, which includes the procedure that must be followed when there is a doubt about a ruling in match play. I recommend that all golfers who play in stroke play competitions (e.g. medal, Stableford and bogey) familiarise themselves with the operation of Rule 3-3. It can be very frustrating to encounter a situation where there is uncertainty over a ruling and the wrong option is chosen, resulting in a penalty of two strokes, or worse still disqualification, which may destroy an otherwise good score for the round. (Edited July 1st 2013) Answer to the last example above: The ball in the photo above is not embedded in the bunker, as it is buried in the roots of the grass-covered ground bordering the bunker . It is also unlikely that it is embedded in a ‘closely mown area’ although this is not definitive from the photo. If it is embedded through the green in an area that is not mown to fairway height, the ruling as to whether relief is available or not will depend on whether the Committee has introduced a Local Rule permitting relief for embedded balls anywhere through the green, which is increasingly likely as more and more courses adopt such a Local Rule, as per the specimen in Appendix l, Part B, 4ba. Now that I have been blogging regularly for approaching five years, many questions on the Rules can be answered by entering a search term in the ‘Search This Blog’ box at the top right corner of my home page. For example, a search on “closely mown area” produces fourteen results, the first three of which contain “Embedded Ball(s)” in the title. I disagree with your ruling on the ball in the photo. Earthen walls of bunkers are part of the bunker. It's irrelevant whether the ball "touches sand". There was no earthen wall in the photo! My reasoning is that the ball in the photo is embedded in the ground (roots) above the level of the sand and is therefore embedded ‘through the green’ and not in the bunker. In my opinion, the lip of the bunker is covered in grass and is therefore not in the bunker; also the Definition of Bunker confirms that grass-covered ground bordering a bunker is not part of the bunker. Still disagree with the opinion. I always try to justify my answers with references to the Rules; it would be interesting to hear on what basis you disagree with the reasoning I have provided above. It's not "grass covered ground" as per the definition. It's an earthen wall with some roots included (as nearly all earthen walls include). OK, that is where we disagree. In my opinion, the bunker in the photo does not have an earthen wall, which is a design feature not commonly used by course designers, and the ball clearly lies in the roots of the grass on top of the bunker. What are your views on the "basketsticks"at the US open rule 17 says "fLAGSTICKS" a basket is not a flag, a possible conflict. I hope this does not catch on what do you think. I am not enamoured with the baskets used in Merion, but I do respect their tradition. "The “flagstick” is a movable straight indicator, with or without bunting or other material attached, centered in the hole to show its position. It must be circular in cross-section. Padding or shock absorbent material that might unduly influence the movement of the ball is prohibited. Q. Because a boundary wall is in disrepair and the inside face is irregular, the Committee has declared by Local Rule that a ball is not out of bounds until it is beyond the wall. Is this permissible or must the inside face of the wall serve as the boundary line? A.Such procedure is permissible. There is nothing in the Rules stating that, in the case of a boundary wall, the inside face of the wall serves as the boundary line.